Leamington was called Cambridge West until 1907. Then, with a population of 500 it was released from the control of the Pukekura Road Board to be administered by its own Leamington Town Board. Leamington street names have a learned air. They are named after poets and authors, with Shakespeare being the main thoroughfare. Some of the houses in Leamington are registered on Waipa District Council’s Heritage List. An alternative walk is to follow the Green Belt around the 8km perimeter of Leamington. View “Heritage Walk – Leamington” in a larger map. 1. At the end of Addison Street is a farm track along a stream (which has many new trees planted by the Cambridge Tree Trust) which runs beside a Lookout Pa on top of a hill and comes out at the Leamington Cemetery. Before the Europeans arrived in 1864, and started planting numerous trees, Maori inhabited many of these sites as it was easy to see from hilltop to hilltop. 2. 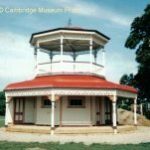 The Band Rotunda was built in 1910 on the corner of Pope Terrace and Bracken Street, and was moved (with the help of a traction engine) to the Leamington Domain in 1921. The Domain caters for the camping ground, tennis, netball, skating, bowls, petanque, croquet and the children’s playground. 3. Some of the houses in Leamington are registered on Waipa District Council’s Heritage List. 74 Shakespeare Street was built in 1902 and is a bay villa originally with bullnose verandahs on three sides. Protected trees are on the property. 4. At 109 Shakespeare Street is a small kauri cottage built c1879. The front of this cottage, when occupied by Benjamin and Sarah Garland, was the General Store and Post Office with ‘lean to’ living quarters added to the back. 5. A Leamington Town Hall was built in 1912 on the corner of Shakespeare and Thompson Streets. Leamington was the first district in the Waikato to benefit from electricity from HoraHora, and during a celebration on 29 April 1921 the Leamington hall was ceremoniously flooded with a magnificent light from nine powerful lamps. 6. At 35 Campbell Street is a well preserved square cottage with extensive gardens. 7. The house on the hill (surrounded by a small farm) off Campbell and Burns Streets is Whare Ora’ – (House of Health). This house was built for William and Mary Rout in 1901/02. The architect was Mahoney and Sons, and the builder was William Hogan. The cost of building was £842. In 1903, Holmes the architect arranged for alterations and an inside toilet for a further £250, and in 1907 the builder Marcroft extended the breakfast room. It is now part of Lauriston Park retirement village. 8. The Leamington Primary School is in Lamb Street and was built in 1880 in the middle of a wilderness of ti-tree and fern. There were no roads – only rough tracks through the scrub. 46 boys and girls turned up on opening day. 9. From Lamb Street, through the BMX track, are duckboards over the ‘Wetlands’. These come out at Shelley Street. Recent subdivisions have pushed the pukeko further out into the country. 10. On the Green Belt on the corner of Shelley and Arnold Streets was the home of comedian Billy T James when he attended Leamington School. It has since been pulled down. 11. 19 Goldsmith Street has a Victorian bay villa with a corner entrance and two verandahs surrounded by trees including a protected magnolia. 12. Down Marlow Drive and into Fletcher Place takes you to the Poets Track along the river. This comes out at the Victoria Bridge and then the Soldiers Track continues around the river to the Fergusson Bridge. 13. On the river side of Pope Terrace is a wooden two storey house which was shifted up from Wellington in 1986. 14. The big house set back behind the trees by Lyndsay Park is ‘Summerleas’ – built in 1924 from the plans of Edgecombe and White, by Speight Pearce Nicoll & Davys, for A H Gascoigne. 15. Just before the Victoria Bridge is an old concrete cattle trough. This was not only used to alleviate the thirst of numerous animals on their way to the Cambridge sales but the roads were so bad that pedestrians used it to clean off their boots before proceeding into the Cambridge township. 16. Along Wordsworth Street, number 26 has a protected karaka, three Spanish chestnuts, rhododendron, weeping elm, oak and a Japanese cedar. 17. Near the corner of Wordsworth and Burns Streets are two ornate villas with wooden fretwork, bay windows, gables and bull nose verandahs. 18. A protected Indian Cedar tree is on the corner of Shakespeare and Cook Streets.